My wife and I greatly appreciate your most kind invitation to lunch today. I want to thank the Council of Ministers for hosting this event and the generosity of your welcome. It has been under two days since our arrival in the Isle of Man. But even in that short time I personally feel this has been a most successful visit. This success would not have been possible without the thoughtful arrangements of Chief Minister Bell. Over the past two days I have had in-depth exchange of views with Governor Wood, Chief Minister Bell and Madam President Christian. 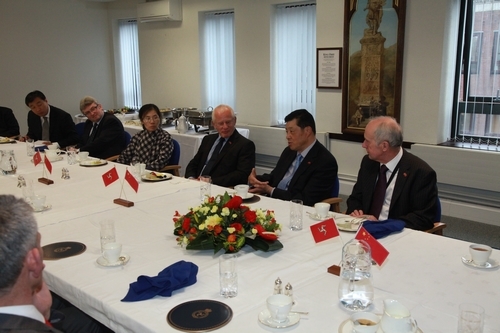 We discussed how to promote exchanges and cooperation between China and the Isle of Man in various fields. I am delighted to tell you we have reached a broad consensus. During the visit I have learned that the flag of the Isle of Man features a triskelion made up of three armored legs. In the context of deepening ties between China and the Isle of Man, I believe they carry much symbolism as they show momentum should be built in the following three areas to promote our friendship and cooperation. First, we need to enhance mutual understanding. Mutual understanding is the very foundation of friendship and cooperation. Our two sides should have more exchange of visits at all levels and gain a better knowledge of each other. We welcome the government and businesses of the Isle of Man to organize publicity events in China so that more Chinese people will know about the Isle of Man. The Isle of Man boasts beautiful landscape, long history and a unique culture. I have no doubt that more and more Chinese tourists will come to experience these aspects for themselves. 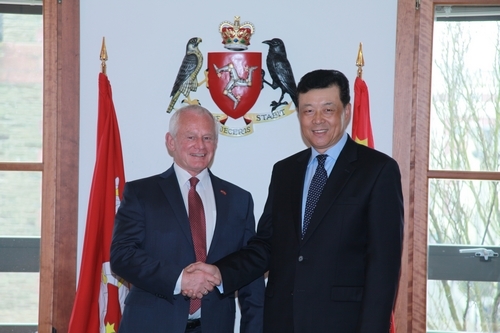 We also welcome more people from the Isle of Man to visit China. Second, we need to strengthen economic cooperation. The Isle of Man is a world renowned international centre for off-shore financial business. You have unmatched advantages in attracting international investments. I am glad that our cooperation in the economic field has already made some progress. For example, China and the Isle of Man have signed the Tax Information Exchange Agreement. Also many of your companies have set up factories in China. Going forward, we should further tap into our potential, boost up our economic cooperation and make it more fruitful. Minister for Economic Development Mr. Shimmin will visit China in just a few days. I wish his visit a great success. We also welcome Chief Minister Bell to visit China at a time of mutual convenience. Third, expand cultural and people-to-people exchanges. We already have some success stories in this field. The Ballakermeen High School and No1 Middle School of Liuyang city of China’s Hu’nan Province have become sister schools. Last year teachers and students of these two schools exchanged visits. This morning I visited the Ballakermeen High School and talked to teachers and students there who have visited or are going to visit China. I also exchanged views with Minister for Education and Children, Mr. Tim Crookall, on our educational cooperation. Moreover, the Isle of Man has great strengths in creative and sporting industries. The Isle of Man TT is an event much celebrated around the world. Therefore our two sides may well scale up exchanges in culture and sport. These will further substantiate our relations. These words should be our motivation for positive action! I hope that China and the Isle of Man will seize the current opportunities. That means expanding exchanges and cooperation in fields of common interest to achieve greater win-win results.